Look splendidly dapper wearing this impressive formal shirt from the house of THE BEAR HOUSE. 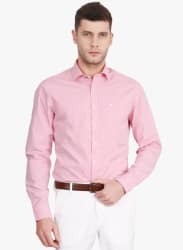 Featuring an spread collar and long sleeves in a regular fit, this cotton formal shirt will keep you at ease all day long. Style it with a pair of formal trouser and oxford shoes while heading for a business meet.